I was working on my short circuit mig techniques and in doing that, I did some cut and etch testing because I want my welds to be sound as well as look good. I was using my Lincoln 210mp welder with .030" er70s6 wire and C25 gas. Since I was welding 10 ga material ( approx 1/8" or 3.2mm thick) my settings were 19 volts and 310 inches per minute of wire speed. The machines default settings for 10 ga were 19 volts and 280 ipm but I was doing push vs pull welds and the higher wire speed yielded less spatter on the welds that were pushed. 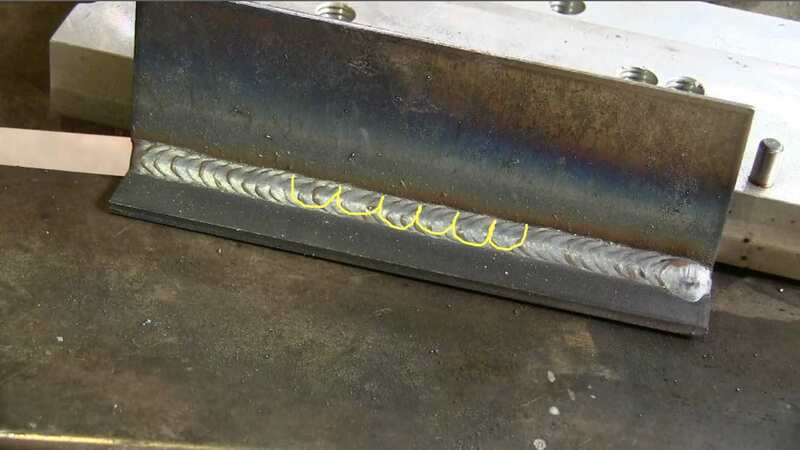 There are several different techniques that can be used for short circuit mig welding. I tend to use the one shown above where a series of cursive E's basically keeps the arc close to the leading edge of the puddle. With a cursive E, the arc backs up into the puddle a bit and that can provide for some buildup in the puddle. If less build up is needed, then a slightly different technique using a U speeds up travel speed and still provides uniformity. The main thing is to watch the leading edge of the puddle to make sure adequate penetration is being achieved. One of the best ways to test for penetration is the cut and tech test. I cut the joints using a Metabo 6" angle grinder and cutting wheel, then use 3 different sanding discs until I have a fairly smooth surface. There are several different solutions that will etch the weld and show the weld nugget. Naval jelly rust remover is one of the easiest ones but it takes a few minutes ...it works quicker if a heat gun is used to warm up the metal. 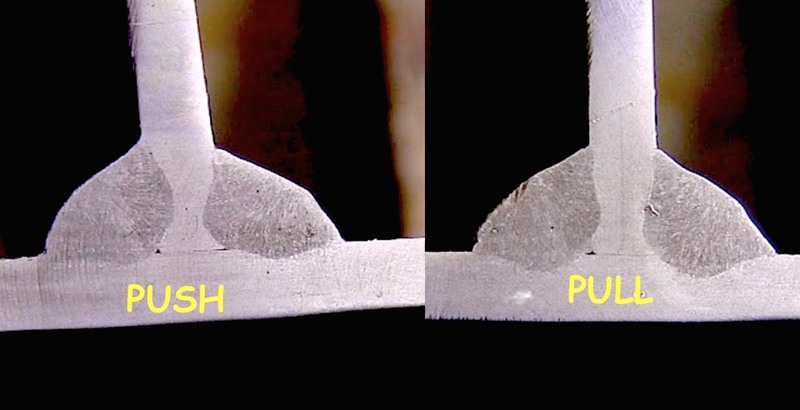 As you can see in the photo above, there are subtle differences in the push vs pull samples. Since this was a manual weld, some of the differences might be attributed to my gun angle but after doing quite a few of these push vs pull samples, I can tell you that these results are very typical. The penetration is usually a little bit better on the pull technique. I know there is always a lot of argument on this topic so I suggest you do your own tests just like I did. I always learn something and you will too.